MERRY CHRISTMAS – JUST ADD GIN! Today being Christmas Day we assume most of your are either opening presents or sleeping in this morning. We are too! 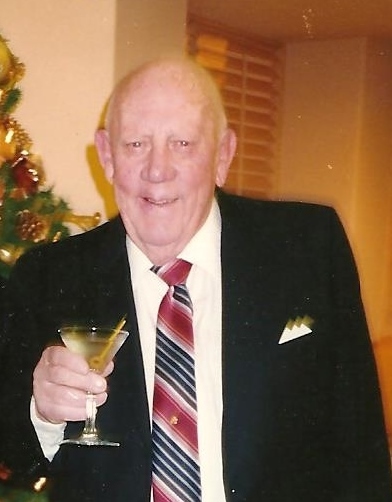 So today we share some thoughts about our dad and, as always, share his famous Christmas Ice Cream Gin Fizz recipe. Wishing you and yours a very happy holiday. 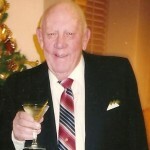 This will be the 16th Christmas without our dad. I miss him just as much this year as I did that very first one. He was a happy, joyful guy, always kind and helpful to others. He was also one of the funniest people I’ve ever met. All year long he embodied the Christmas spirit and when I was very young I thought he even looked like Santa, with his twinkling blue eyes, rosy cheeks and a stomach that shook like a bowl full of jelly. He loved the holidays, welcoming friends and family alike into our home. Our whole family misses his loving spirit but we also recognize we were very lucky to have him as long as we did and are grateful that he left us with so many cherished Christmas memories. One of Pop’s hallmarks was the Ice Cream Gin fizz he served every Christmas morning. Oh sure, most families had hot chocolate and cider while we were drinking gin. But don’t judge – it has given a roseate hue to many a Christmas morning. We share it in the hopes that you can start your own Christmas memories. Just keep it away from your Drunk Uncle. Just blend it well and – voila – you have a concoction sure to put a positive spin on everyone and every thing! Our mom served them in a wine glass with a dash of nutmeg. As we got older we conspired with Pop and ditched the wine glass for a chilled beer mug from the freezer. Saved having to go back for seconds…or thirds. We wish everyone a Happy Holiday season – we’ll be back in 2018! This past weekend I celebrated an annual tradition – putting up Bob’s Christmas Birthday Tree. Yes, today is brother Bob’s birthday and like most kids who had the misfortune to be born around the holidays, his birthday usually morphed into a birthday/Christmas celebration. In his case, his birthday was the day our mom chose to put up our Christmas tree each year. So really, between getting screwed out of a proper birthday party and being a middle child it’s really a wonder that he didn’t develop a twitch. This year as I put up my tree I thought about a friend’s comment last week – that she hated the holidays because it brought back such sentimental memories. This time of year does make us miss those who are far away and especially those who have shuffled off this mortal coil, but I guess I have the opposite reaction. I admit not all Christmases are created equal, but I love that the holidays cause me to pause and reflect on the special ones I’ve had over the years. One of my favorites is of the year our daughter came home from her freshman year in college. We made plans to attend Christmas Eve church services followed by dinner at a swanky restaurant, but as the hour approached we all decided it was too much effort. Instead we donned our jammies, ordered Chinese takeout and watched “Christmas Vacation” on TV. Now THAT was memorable – we still laugh about it today. And of course, some of the best Christmases were spent watching our grandsons when they were toddlers, racing out on Christmas morning amazed that a tree that had been barren the night before was now laden with intriguing boxes and bows, confirming their notion that Santa Claus really DOES exist! My fondest memories seem to be of “coming home” to our parent’s house for Christmas. 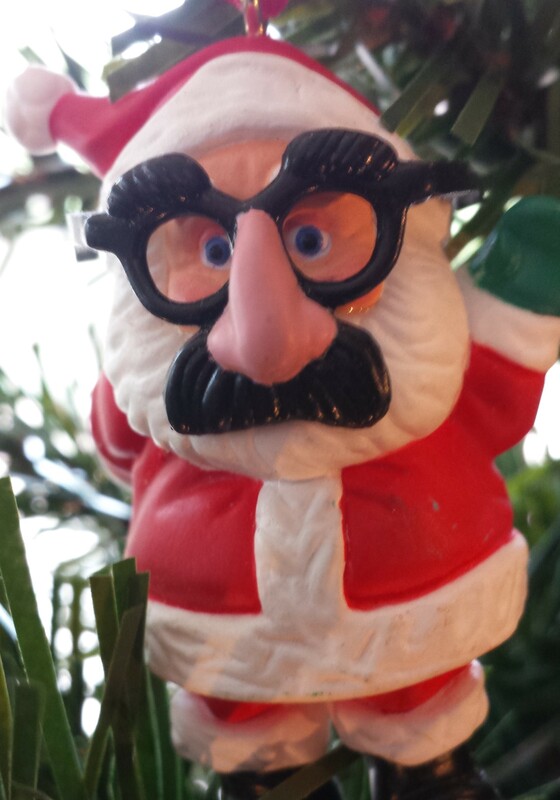 I pondered that this weekend as I was putting the Santa Claus with the fake nose and glasses on my tree (somehow it always reminds me of Bob). As I think back, Christmas seemed so easy then. Our mom did all the planning, shopping, wrapping, cooking, serving, and I’m embarrassed to say, cleaning up. 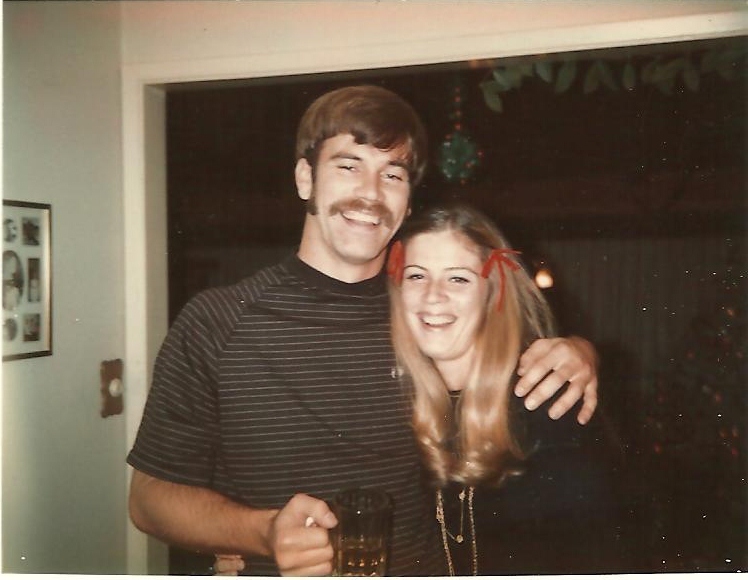 Like a lot of young adults, college and our careers took us in different directions, but most Christmases we gathered at mom and pop’s and immediately began to act like little kids. We laughed, drank, ate, drank, sang, drank. On Christmas Eve mom would put out a large buffet and around 5 o’clock friends would begin to arrive to share in our “spirit”. Usually those spirits flowed until the wee hours of the morning, and then our parents would arise on Christmas morning to prepare for the arrival of our grandmother, aunt, uncle and cousins for brunch. Our father often commented that he felt like “a hippopotamus in three feet of mud” on Christmas morning. But mom would always put on a spread and Dad would fix his famous Christmas Ice Cream Fizz*. Again, we kids were of minimal help. So of course I think about those years as fun – I didn’t have to do any of the work! This pattern held true for many, many years right up to my favorite Christmas memory. 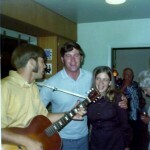 In 1981 we gathered once again at mom and pop’s house – Jack left his restaurant in Tahoe for a night, Bob and Linda came up from Orange County and I made the one hour trek from the East Bay. It was a Monday – I remember that because we had Monday Night Football on and Don Meredith kept singing “Turn Out the Lights”. For whatever reason, we were more giddy than usual that year. Then at some point after dinner someone suggested that we serenade the neighborhood with Christmas Carols. GREAT IDEA!!!! Mom didn’t approve of our shenanigans and I’m sure had images of being run out of town. But the rest of us grabbed another drink and off we went. Now you need to know that Bob and Linda actually performed professionally at that time and are both great singers. Jack and I can carry a tune. 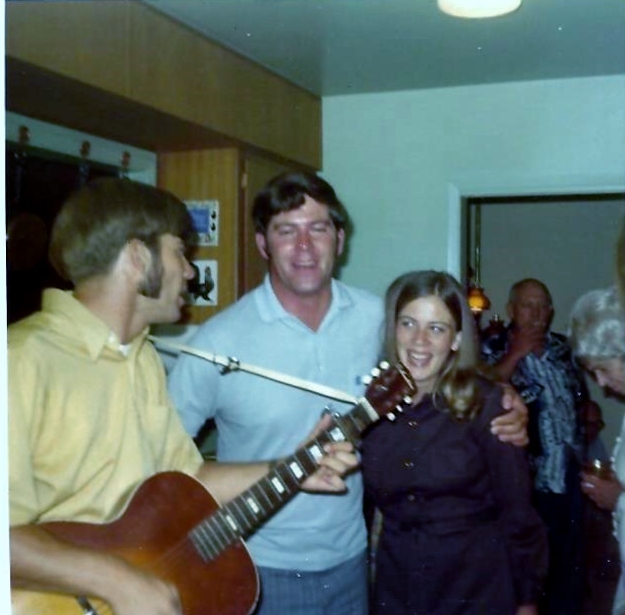 As for Pop…well, let’s just say that dad had more gusto and enthusiasm than actual talent. But he was an extremely good judge of character so he knew which neighbors would find us amusing and which might throw old shoes at us. So off we traipsed, arm in arm around the neighborhood singing our hearts out. Most everyone laughed, some gave us cookies and some even offered to refill our glasses (which was really not necessary at that point). We sang for about an hour, which I think is how long it took us to run through our Christmas Carol songbook. Then we collapsed in gales of laughter at home. 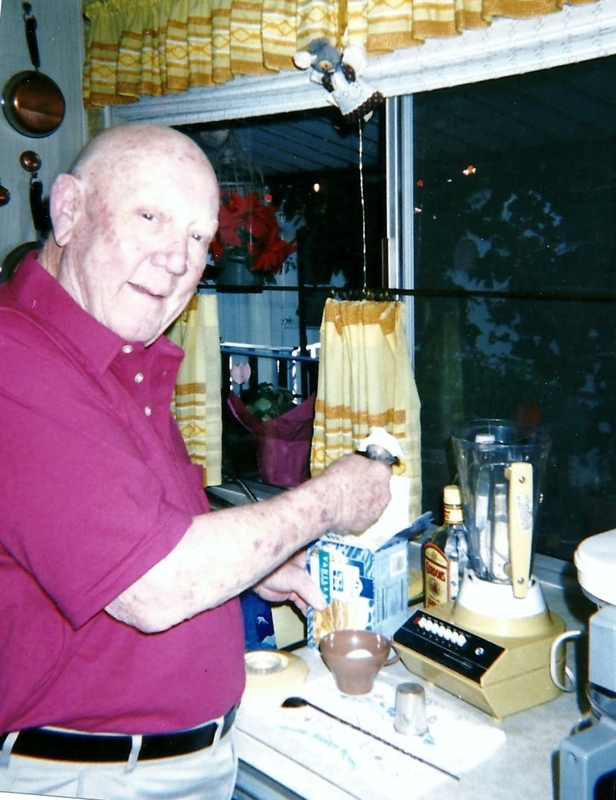 The next morning, sure as rain, Pop was up making us his Christmas Ice Cream Fizz. We didn’t know it at the time but it would be the last Christmas we would spend at mom and dad’s house. 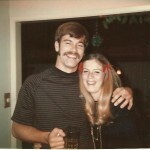 The next year Bob and Linda were expecting their first child and from then on, when we could, we gathered at their home in Southern California. But I’ll always remember with fondness the rollicking good time we had that final year. Hopefully you have some wonderful memories that sustain you during this holiday period. If so, consider yourself lucky. And finally not to be forgotten – please join me in wishing a very happy birthday to my very special brother. Hopefully he won’t have to put a tree up today. 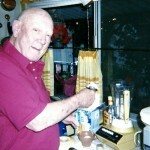 *As a special gift to our readers, once again this year I am providing the recipe for Pop’s Christmas Ice Cream Fizz. Trust me, it will make that time you have to spend with your brother-in-law that borrowed your lawnmower and/or $5000 much more bearable. Just blend it well and – voila – you have a concoction sure to put a rosy hue on everyone and every thing! Our mom served them in a wine glass with a dash of nutmeg. As we got older we would conspire with Pop and ditch the wine glass for a chilled beer mug from the freezer. Saved having to go back for seconds…or thirds. There are many annoying things about Facebook but every once in a while it has a redeeming feature: reconnecting with old friends and long-lost family members. Such was the case with us this year. We were fortunate enough to find three cousins with whom we’d lost touch. Or maybe they’ve been avoiding us. In any event, we’ve had fun exchanging old family photos and sharing stories. Our cousin, Tracy Nutting Sanborn, reminded me that one of her favorite holiday traditions was our dad’s Christmas morning ice cream fizzes. Or as he called them, “The Good Fairy Fizzes”. In any event, in the spirit of the season, I am sharing a bit about the fizz and Pop’s famous recipe. First, it’s important to understand that Christmas Eve at our parent’s house was always a rollicking affair. Mom put out a buffet spread mid-afternoon and people began to arrive in droves. Tons of their friends plus dad’s cousin and his family were there every year. As we kids got older our friends would escape their sedate family gatherings to party at the Sparrow house. There was always lots of laughter, joking, singing, and a virtual river of alcohol. Somewhere in there we always opened our gifts. Because we needed to get to some religious service at midnight, you ask? Au contraire. It was because the next morning our paternal grandmother, along with Tracy, her parents and her siblings would arrive for Christmas breakfast. Now that I am older I look back on that tradition and think our parents were out of their minds. The last of the Christmas Eve guests generally didn’t leave until the wee hours of the morning. And then promptly at 10 o’clock, our relatives would arrive for breakfast. And this was no Chinet paper plate or Red Solo Cup affair. For some reason our mother was a bit intimidated by our grandmother. Even after 30 years of marriage and, I might add, producing three spectacular grandchildren. So we had to haul out the Wedgwood china and the good silver every Christmas morning. We hope you and yours have a very happy holiday season and if you find yourself getting just a bit Scroogy, try Pop’s Ice Cream Fizz. It’s a Christmas miracle.